This fabulous pasta recipe takes only 20 minutes to make and with a few added ingredients you will have a fantastic lunch for the next day too (see tip). Pulse the garlic and nuts in a food processor until roughly chopped, add the watercress and pulse again until you have a coarse paste. Spoon into a bowl, stir through the parmesan, then drizzle in the oils until you have a juicy paste. Season with lemon juice, a pinch of salt and lots of black pepper. Stir through the feta, then set aside. Heat a pan over a high heat. Add the lemon slices and quickly fry on each side until starting to caramelise. Remove and set aside. Meanwhile cook the spaghetti in a large pan of boiling salted water for 10 minutes until al dente. 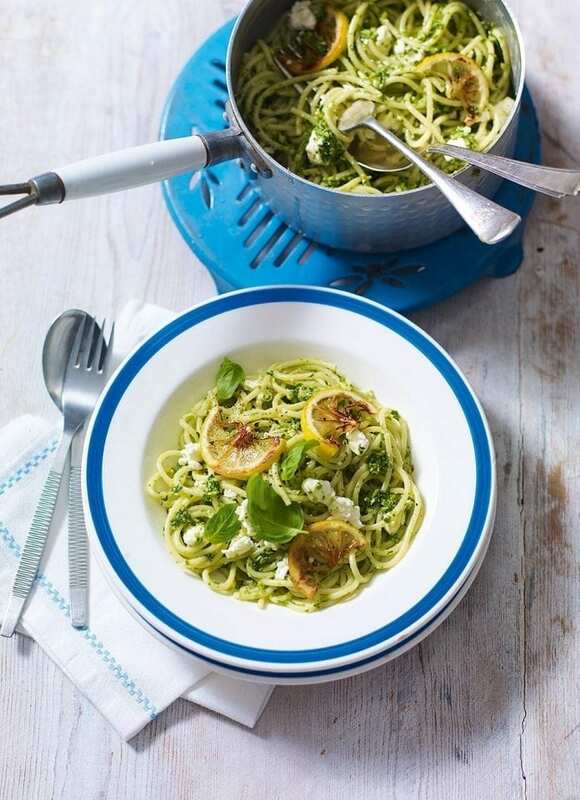 Drain, return to the pan and mix through the pesto and lemon slices. Spoon two-thirds of the pasta evenly among warmed bowls (reserve 250g for lunch the next day), then sprinkle with cracked black pepper and basil leaves to serve. You next-day lunchbox: Whisk 5 medium free-range eggs with a little milk and a pinch of chilli flakes, then season. Heat a knob of butter in a pan, add half the leftover spaghetti and 50g smoked salmon trimmings. Spread over the base of the pan. Pour in half the eggs, swirling to coat. Cook for 5 minutes until beginning to set. Slide onto a plate. Repeat. Cool, then store in the fridge for the next day.